Talented, dedicated, hardworking why not join us! Torrent Pharma UK is a dynamic and expanding pharmaceutical company. As a result we are always looking for career-minded individuals who wish to work in a fast moving progressive environment. Torrent Pharma UK has seen impressive year-on-year growth since conception and would love talented individuals to join us on our journey. 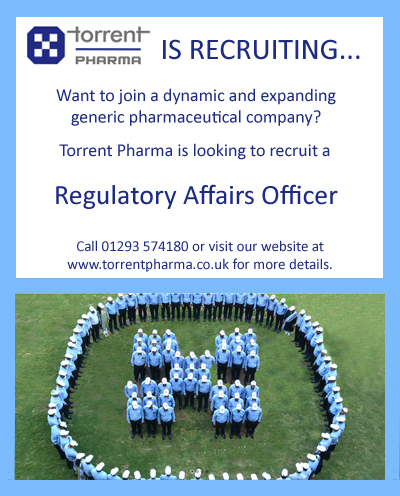 We are wholly owned by Torrent Pharmaceuticals Ltd who are an international pharmaceutical manufacturing and distribution company who have access to unrivalled resources to help ensure our strong growth in the future. If you are intrested in any of the current vacancies or generally in joining the Torrent journey please send your CV to reception@torrentpharma.co.uk.